Melt the butter into the milk chocolate. Stir in the praline paste, mix in the cookie crumbs, and let set in the refrigerator. Scoop or form into small balls (this is easily done if the mixture is cold). *To make brown butter, melt butter in a saucepan, and stir until the butter foams up and the milk solids just begin to turn brown. In order to yield 1/4c, you will have to start out with more – about 1/2 cup. Whip egg white until it holds soft peaks; slowly add sugar, and whip until it is no longer grainy. 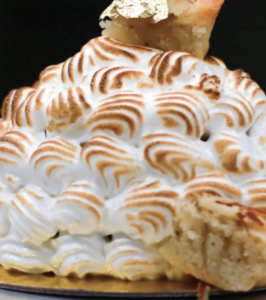 Pipe onto the outside of the domes, and toast the meringue using a torch (or put it ever so briefly under the broiler). Melt the chocolate; set aside. Whisk the yolk, sugar, milk, and first cream together over very low heat until the mixture coats the back of a spoon. Whisk in the bloomed gelatin, and strain over the melted chocolate. Stir until the whole mixture is glossy, and let cool to room temperature. While the chocolate is cooling, whip the remaining cream to soft peaks. 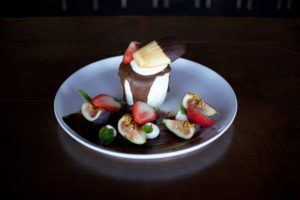 Fold the cream into the chocolate, and pour into half-dome molds, nestling a scoop of the praline mix and a Donsuemor Financier into the mousse. To make frosting: Place room temp cream cheese, sugar, vanilla and almond in mixing bowl and cream together. To make chocolate glaze: In a double boiler bring cream to temp, then slowly add chopped chocolate and incorporate till smooth. Remove from heat and let cool for 15 min, the fold in whip cream. Grease and flour one 9-inch and one 6-inch cake pans and set aside. Preheat oven to 350 degrees. In a large mixing bowl, cream butter or margarine. Gradually add sugar, creaming until light and fluffy. Add egg yolks one at a time, beating well after each addition. Once creamed, beat in vanilla. In a separate bowl, combine flour, cocoa and baking powder. Add 1/3 of the dry mixture to the cream followed by 1/3 of the water; alternate and beat after each addition until smooth. In a small bowl, beat egg whites until stiff but not dry. Gently fold into batter. Pour into prepared pans and bake for about 25 minutes or until a toothpick comes out clean. Rest in pans 10 minutes and turn out on racks until completely cool. Slice the strawberries thinly and place in a large bowl. Sprinkle with sugar, set aside. In a clean mixing bowl, whip cream until almost-stiff peaks form, beat in sugar and vanilla extract, or to taste. In each glass, layer 2 Traditional Madeleines, spoon in strawberries, layer with whipped cream, repeat, topping final product with whipped cream. Garnish with any leftover strawberries and serve immediately with remaining whipped cream or refrigerate until ready to serve. This recipe can be used throughout the year but adds beautiful elegance to your Thanksgiving table. 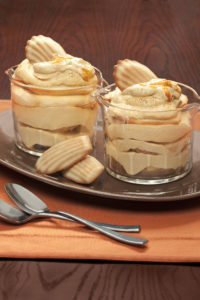 You can make individual glasses of the tiramisu or make it in an 8×8 inch pan and serve as wedges. Garnish with whipped cream flavored with sugar and a dash of cinnamon. In a mixer with fitted with a chilled metal bowl and beater attached, beat whipping cream and sugar until soft peaks form. Add the cheese, pumpkin and spices, beating until smooth. Line bottom of an 8 x 8 inch dish with the Madeleines, overlapping and crowding to fit. Sprinkle with 2 tablespoons rum. Spread half of filling over Madeleines. Repeat with the remaining Madeleines, remaining 2 tablespoons rum, and remaining filling. Smooth. Wrap tightly in plastic wrap and then foil. Chill in the refrigerator overnight. To serve, run a knife around the sides of the pan. Cut into wedges and serve with a sweetened cream. In a large bowl, mash the lemon curd with 2-3 tablespoons of orange juice. Reserve 2 tsp. of lemon curd mixture for later. Mix in the fresh berries (except garnish). Set aside. In a clean mixing bowl, whip (3/4 cup) cream until soft peaks form, beat in sugar. Fold Mascarpone with 1 cup of whipped cream to lighten, do not beat. In each glass, layer whipped cream, stand three Traditional or Lemon Zest Madeleines on end, spoon in berry mixture, layer with whipped cream, repeat with berries, top with whipped cream. Dollop ½ teaspoon Of the lemon curd mixture on top of the whipped cream per parfait; garnish with reserved berries. Serve immediately with remaining whipped cream or refrigerate until ready to serve. Grease each ramekin with butter thoroughly, set aside. In a clean mixing bowl, combine sugar, spices, eggs, vanilla and whiskey. Whisk until combined, whisk in the cream until incorporated. In each ramekin, layer 3 Traditional madeleines, scatter in raisins and ginger, and then distribute egg mixture evenly amongst ramekins. Allow to soak overnight in the refrigerator. When ready to bake, preheat oven to 350°. Bake 350° for about 30 minutes, or until golden and firm. Remove from oven, set aside until cool enough to eat, about 20 minutes. Combine milk and cream in heavy medium saucepan. Scrape in seeds from vanilla bean; add bean. Bring milk mixture to simmer. Remove from heat. Whisk egg yolks and sugar in medium bowl to blend. Slowly whisk hot milk mixture into yolk mixture. Return custard to saucepan. Stir over low heat until custard thickens and leaves path on back of spoon when finger is drawn across, about 5 minutes (do not boil). Strain sauce into small pitcher or bowl. Serve warm with bread pudding. Pulse the French Almond Cakes in a food processor. Pulse until they resemble bread crumbs. Add the melted butter and pulse again. Use an ice cream scoop and add the almond cake mixture to the mason jar. Use the back of a spoon and press the crumbs down. Put the jars in a 9×13 baking dish. Bake in a preheated 350° oven for 8 minutes. Add the cream cheese and sugar to the bowl of a food processor. Run until smooth. Scrape the sides and bottom and run again. Add the egg, lemon, sour cream, vanilla, almond extract and salt. Pour the cheesecake batter over the baked crust. Boil a kettle of water. Take one of the jars out, and pour boiling water halfway up the sides of the jars. Add the jar back to the pan, this helps not get water into the cheesecakes. Bake the cheesecakes for 25 to 30 minutes. The edges should be set, but still have a little jiggle. Cool completely and chill in the refrigerator overnight. Garnish with whipped cream, a single raspberry, and sliced almonds. Cut the top part of the Madeleines and set the Madeleines in oven for 10 to 15 minutes. They need to dry a little, but be careful not to brown them. In the meantime, prepare the cream in a bowl. Mix the Dulce de Leche and almond butter. Once the madeleines are dried, spread the cream over each madeleine. A set of two madeleines will be used for one shortcake. Add approximately 7-8 raspberries on one of the cream-covered madeleines, sprinkle a few lemon drops, and cover with the other madeleine. It is best to let the madeleines absorb some of the cream for a couple of hours before serving. Bring the milk to a boil in a small saucepan. In a medium sized saucepan, whisk together the egg yolks, sugar, and cornstarch until it is well combined and thick. Continue to whisk while you pour in 1/4 cup of the hot milk (you are tempering the eggs). Pour in the remainder of the milk while constantly whisking. Place the pan over medium heat, and continue to whisk while the mixture comes to a boil. Continue at a boil while still whisking for another 1 to 2 minutes and then remove from heat. Whisk in the vanilla extract or paste and let the cream sit for about 5 minutes before whisking in the bits of butter. Stir until the butter bits are fully incorporated and the cream is shiny and smooth. Transfer the cream to a bowl and place a piece of plastic wrap directly on top of the cream to prevent a skin from forming. Place in refrigerator until the cream has completely cooled. Cut stems off of strawberries. With the cut side down, cut a deep ‘x’ into the tip of the strawberry, being careful not to cut all the way through the strawberry. Spread the end slightly. Using a pastry bag with any type of medium sized start tip, pipe pastry cream around the top of the financier in a circle. Place a strawberry on top of the pastry cream, then place the tip of the pastry bag inside of the strawberry and fill with pastry cream. For best appearance, serve as soon as they are prepared, but they can be stored in the refrigerator until you are ready to serve them. Preheat the oven to 325°F. In a medium pot over medium heat, combine heavy cream, milk, and vanilla. Bring to a low boil and turn off heat. Set aside. In a large mixing bowl, whisk egg yolk and 1/2 cup sugar for 1 to 2 minutes until the sugar is well incorporated into the eggs and the mixture is thick. Add the liqueur to the heated milk and stir to combine. Slowly, add 1 cup of the milk mixture to the egg mixture and stir. Repeat until all of the milk mixture is mixed into the egg and sugar. Here is where you have options. Crème Brûlée is traditionally served in shallow Crème Brûlée dish but I’m feeling far from traditional today and for this purpose using a variety of oven proof dishes, including espresso cups, for the fun of it. This recipe will allow for 4 servings of crème that measure 1/2 cup each. If you are using a traditional shallow crème brûlée dish, slice 1 Donsuemor Madeleine in half and press hard into the bottom of the dish forming a crust. If you are using a ramekin or any other oven safe dish, prop a Donsuemor Madeleine against the side of the ramekin. You may also slice it in half but I found it makes a nicer presentation if left whole. Ladle the crème into the ramekins and fill until about 1/2 inch from the top. Place the ramekins on an oven safe dish. I line mine with a tea towel to prevent the ramekins from slipping. Pour hot water into the dish until the water reaches halfway up the ramekins. Place in the oven and bake for 40 to 45 minutes until the crème is set. It will appear a little jiggly. Remove from the oven and place in the refrigerator for at least 3 hours. This can be done up to one day ahead of serving. Remove from the refrigerator and allow to set at room temperature for 30 minutes. Sprinkle about 1 to 1 1/2 teaspoons of sugar onto the top of the crème. With a kitchen torch, gently caramelize the sugar until it browns and bubbles. Serve when the bubbles subside, about 1 to 2 minutes. If you don’t have a torch you can use your broiler. For broiler caramelization: preheat the broiler. Place the ramekins on a baking dish with ice. Place the dish under the broiler and stand guard. It might take minutes or seconds for the sugar to caramelize. Remove when the sugar has browned. Beat whipping cream in a large bowl with a hand or a stand mixer. While mixing, add the powdered sugar and vanilla. Beat until whipped cream forms. Line the bottom of an 8×8” pan with 12 madeleines. Top with half the whipped cream. Add half the strawberries and the other 12 madeleines. Top with the rest of the whipped cream and the rest of the strawberries. Cover and chill at least 1 hour before serving. Best eaten the day it’s made. Mix the matcha powder, sugar and salt in a glass container. 1. Add half the boiling water, stirring until the matcha and sugar are dissolved. Mix the cornstarch, vanilla and remaining water together until smooth. 1. Warm the cream and matcha mixture in a small pan until bubbling slightly. Add the vanilla and the cornstarch mixture and whisk continuously until the mixture thickens slightly. Cool before serving. Preheat broiler to 360 degrees. Place cookies on a foil-lined cooking tray and top each cookie with chocolate and half a marshmallow. Broil ~2-3 minutes, or until chocolate is melted and marshmallow is toasted. Toast marshmallows over a campfire or gas range, sandwich between cookies and chocolate. Top with matcha mixture, and voila! Preheat broiler to 360 degrees. Place cookies on a foil-lined cooking tray and top each cookie with chocolate, caramel and half a marshmallow. Broil ~2-3 minutes, or until chocolate and caramel are melted and marshmallow is toasted. Toast marshmallows over a campfire or gas range, sandwich between cookies, caramel and chocolate. 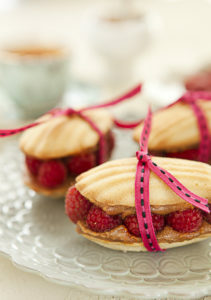 Top with jam or raspberries, and voila! Preheat broiler to 360 degrees. Place cookies on a foil lined tray and top with cheese, apple and marshmallow. Broil ~2-3 minutes, or until cheese is melted and marshmallow is toasted. Toast marshmallows over a campfire or gas range, sandwich between cookies, cheese and apple. Preheat broiler. Place cookies on a lightly greased cooking tray and top with marshmallow. Broil ~2-3 minutes, or until chocolate is melted and marshmallow is toasted. Coat other half of cookie with PB&J and chocolate. Sandwich together. Toast marshmallows over a campfire or gas range. Coat other half of cookie with PB&J and chocolate. Sandwich together. Preheat broiler to 360 degrees. Place cookies on a foil lined cooking tray and top with marshmallow. Broil ~2-3 minutes, or until chocolate is melted and marshmallow is toasted. Coat other half of cookie with Nutella and top with banana. Sandwich together. Toast marshmallows over a campfire or gas range, sandwich between Nutella coated cookies and banana. Donsuemor is committed to customer satisfaction. If for any reason you are not completely satisfied with your order, please contact us at 888-420-4441 or e-mail us at remember@donsuemor.com. Our madeleines are a perishable product and cannot be returned. Please enter your shipping information carefully. You are responsible for all costs related to undeliverable orders which result from incorrectly entered shipping information. Prices include shipping and handling within the continental United States. Shipping to Alaska and Hawaii is available for an additional $30 charge. Simply place your order and we will contact you for payment of the additional charge to be billed to your credit card. All orders will be shipped by FedEx and will arrive within 10 business days from your order date. If you require your order to arrive on a specific delivery date or would like to place a future fulfill order, please call us at 888-420-4441 and we will gladly accommodate your request. We can accommodate only one shipping address per order/transaction. In order to process your transaction when ordering from our website, we ask that you enter your: name, e-mail address, mailing address, and credit card information. Your information, whether public or private will not be sold, exchanged, transferred or given to any other company for any reason whatsoever, without your consent, other than for the express purpose of delivering the purchased product. Donsuemor implements a variety of security measures to maintain the safety of your personal information when you place an order. We offer the use of a secure server. All supplied sensitive/credit information is transmitted via Secure Socket Layer (SSL) technology and then encrypted into our Payment gateway providers database only to be accessible by those authorized with special access rights to such systems, and are required to keep the information confidential. After a transaction, your private information (credit cards, etc.) will not be kept on file for more than 60 days. We are in compliance with the requirements of COPPA (Childrens Online Privacy Protection Act); we do not collect any information from anyone under 13 years of age. Our website, products and services are all directed to people who are at least 13 years of age or older. Thanks for your interest in joining the Donsuemor team. We love our sweet, petite and unique specialty baked goods. We currently don't have any open positions, but we are always looking for talent to help create, sell and love our products. If you are interested, please send your resume to: careers@donsuemor.com.